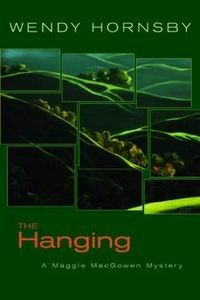 The Hanging by Wendy Hornsby: Synopsis and Online Purchase Options. Synopsis (from the publisher): When her television series is abruptly canceled, investigative filmmaker Maggie MacGowen accepts a short-term contract to teach film production at a local community college — an interesting diversion, she thinks, until the next TV gig comes along. But if Maggie expects her sojourn in the ivory tower to be peaceful, she is dead wrong. Instead, she finds herself in the middle of an explosive power struggle. In the current era of budget cuts and fee increases, community college president Park Holloway arouses faculty and student animosity with his expensive building program, especially an admin building derisively nicknamed the Taj Ma'Holloway. When Maggie finds the college president hanging in the building's stairwell, suspicion falls not on her, but on her young friend Sly Miller. A world-class artist, his sculpture was supposed to be hanging in place of the body. That's only the beginning of a twisty plot dealing with the aesthetics and business of art, a billion-dollar art-for-arms deal; political corruption and cronyism; and issues of art forgery and journalistic ethics, all capped off by a stunning denouement.